The Sony A9F is a fantastic TV for those looking for an immersive content consumption experience. 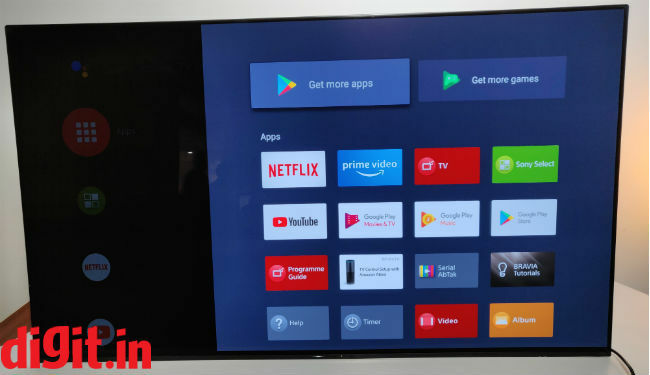 The new processor brings with it advancements in HDR processing, the TV can upscale HD content quite well, comes with ample connectivity options including the option to use the TV speakers as the center channel in your home theatre. The UI is fluid and native streaming apps means you don’t need to resort to an external device. The TV is great for 4K gaming too. The only downside is that some Dolby Vision content looks a little dark and the TV is extremely expensive. But if pure performance is what you are looking for then you can’t go wrong with this TV. 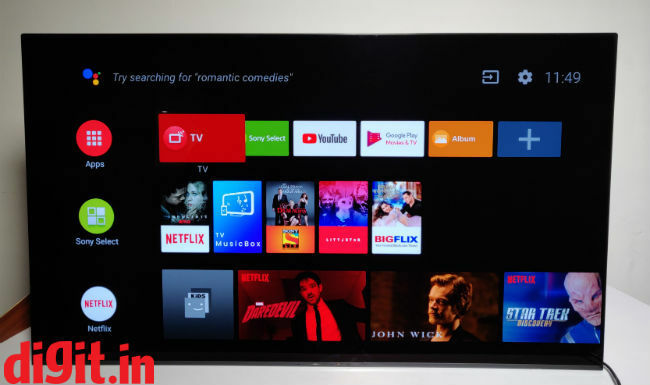 At CES 2018, Sony showed off the A8F OLED TV which launched earlier this year in India. The TV brought with it a new design but was essentially the A1 repackaged for 2018. You can read our review of the Sony A8F here. The highlight of Sony’s CES 2018 presence was the new X1 Ultimate chip that would replace scene-based rendering to object based rendering making HDR content look even more desirable. Sadly, there were no consumer TVs displayed showing off the power of the X1 Ultimate chip. Fast forward a few months and Sony announced their Master Series of TVs – the A9F and the Z9D. 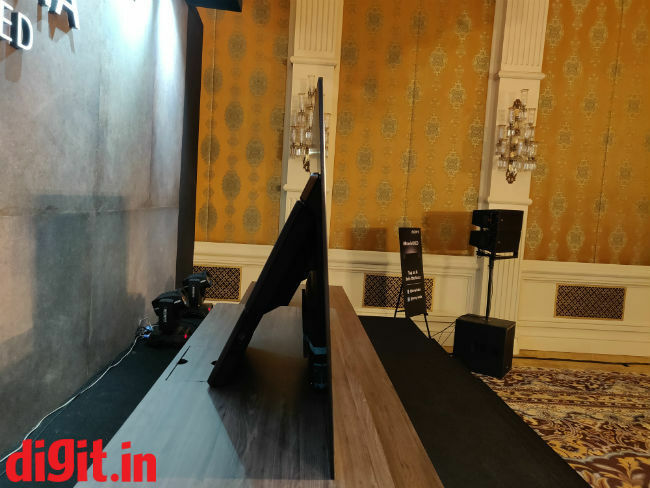 The A9F is an OLED TV and is available in India whereas the Z9D is as LED TV and Sony did not launch it in India. The A9F we have with us today for review is a 55-inch variant. Is the X1 Ultimate the right move for flagship OLED TV’s from Sony? Place the Sony A1 and the A9F side by side and you will not be able to tell one from the other. Sony has brought back the picture frame design of the A1. The TV tilts back by about 5-degrees and stands just like a picture frame should. The tilt is barely noticeable, and the TV is designed to be the centerpiece of your home entertainment system. The TV can be wall mounted, but the design of the stand and the placement of the ports is such that you will want to put it on a table. When placed on a table, the only thing you will see is the screen. There is a small white LED at the bottom of the display that is lit when the TV is on and if you find this distracting, you can switch it off from the settings. The bezels surrounding the display are quite thin. The only downside is unlike traditional stands, there is no space between the table and the bottom of the screen. This means, that if you place a soundbar in front of the TV, it will obstruct your view. If you are someone who places all your gadgets like a Blu-ray player, gaming console, etc. below the TV, you will have to reconsider its placement. Coming to the connectivity options, they are all neatly laid out and hidden behind the cover on the stand of the TV. On the right side of the kickstand you have one USB port whereas on the left you have one HDMI port. Everything else is hidden behind the cover. At the back you have the power in, center speaker (we will speak more about this in a bit), antenna in, ethernet port, video in, IR blaster port, optical out, 3 HDMI ports, 2 USB ports and the headphones out. 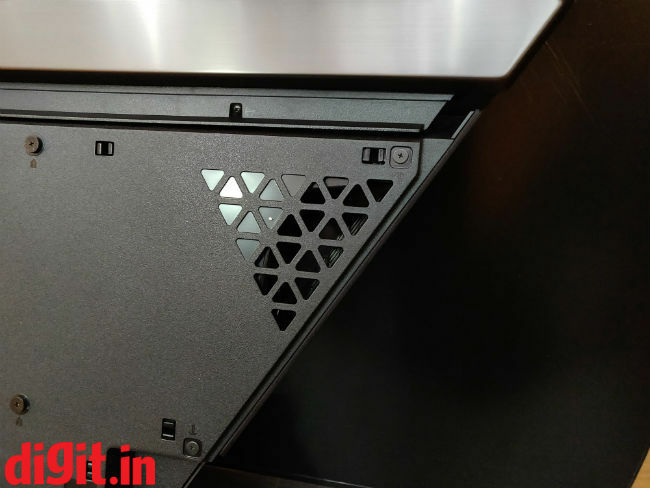 The ports are very neatly laid out and the cable management ensures all your wires are neatly organised. Overall, the build quality of the TV is top-notch. The panel is slim but the picture frame like design means that it will occupy more space on a table. Personally, I’d prefer if Sony went with the design of the A8 instead of the A1 for the A9F but the design they have chosen is more to do with the new acoustic surface. We will touch upon this in the audio segment of the review. The panel on the A9F is the same as it was on the A8F with the improvements coming thanks to the new chip under the hood. It is with the picture settings and the picture performance that the A9F sets itself apart from the A8F. Now, the A8F was powered by the X1 Extreme chipset and the new A9F is powered by the X1 Ultimate chip. The X1 Ultimate is said to be twice as powerful as the X1 Extreme and also brings with it better picture processing along with object based HDR rendering. What this means is that each individual small object is recognised, and the colour, contrast and sharpness is adjusted for each individual object. So, in the past, if there was a bunch of grapes on screen, the bunch was considered as one object to render. Now, with the X1 Ultimate, each individual grape is a separate object that will be rendered. In theory this sounds like fantastic optimisation for HDR implementations. In reality however, there are some really small caveats which we will get to in the HDR section. The beauty of an OLED TV is its ability to produce infinite contrast ratio, true blacks and deep colours and all of it is there in the Sony A9F. 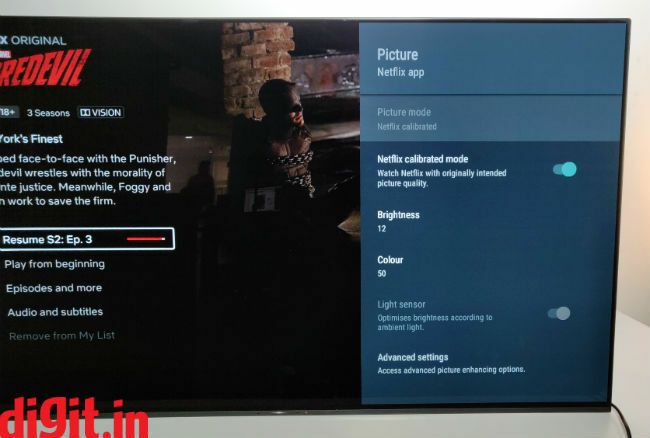 The TV can natively produce Dolby Vision content through the built in Netflix app. If you have a Blu-ray player and have Dolby vision supported content on it, then you can truly make the most of this TV. However, there is one problem that I encountered. Some sequences, especially the ones in the dark, like the Daredevil season 2 episode 3 staircase fight sequence looked slightly darker than I’d like. 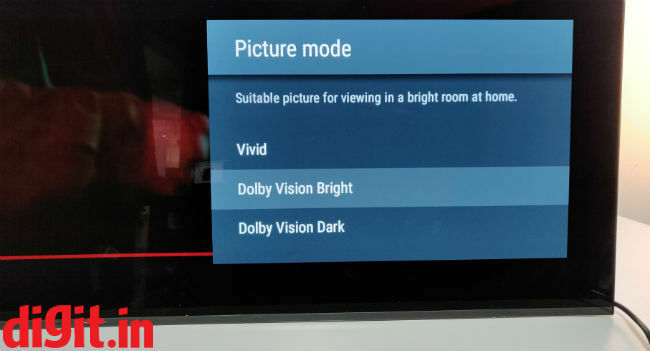 I tried toggling between the Dolby vision dark mode, Dolby vision bright mode and the vivid mode to see which one worked best and they all had some flaw or the other. This is the only sequence where I encountered this problem so its safe to say that it is limited to certain content that takes place in pitch darkness. I did not encounter this anywhere else. Having said that any content you may have in HDR 10, looks fantastic with its contrast, colours and details. Watching content from Prime Videos, Netflix and more was an absolute treat in 4K. The TV also boasts of a Netflix mode, but it didn’t kick in automatically for me when playing Netflix. I had to manually go into the picture settings and change it to the Netflix mode. 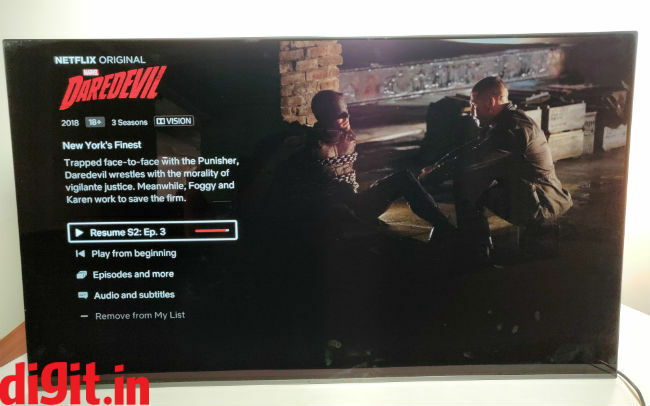 I watched content from Daredevil, Star Trek Discover and some more switching between Dolby Vision and Netflix mode and honestly, I was hard-pressed to find some difference. I am sure consuming more content like Lost in Space, Haunting on Hill House and more would result in me finding some differences, but the content anyways looks so good you wouldn’t bother. I played Blade Runner 2049, Spider-Man Homecoming and Wonder Woman from the Prime Videos app and everyone who I blind tested the video with on the A9F said the picture looked 4K. Even though these titles play at a maximum of 1080p on the Prime videos app, it is commendable how beautiful 1080p content look on the panel. Sure, there are times when 1080p and 720p videos from YouTube don’t look as great however, that’s an exception. If you will watch SD content, content from your set top box or any 1080p content, then you will get a very good experience. Before we move to gaming there is one thing you should know. All the 4 HDMI ports in the TV support HDCP 2.3 full bandwidth which is fantastic. I highly recommend going into the settings and enabling them to make the most of the 4K HDR devices you will connect to the TV like your Apple TV 4K, PS4 Pro, Xbox One X, etc. We played our standard suite of test games using a PS4 Pro and Xbox One X on the TV. These games range from Battlefield 1 to Uncharted: The Lost Legacy, God of War, Gears of War 4, Forza Horizon 3 and more. Honestly, it looked as good if not better than what we have seen on the A8F, and the LG C8 which we tested earlier this year. Games like Horizon Zero Dawn and God of War along with Spider-man for the PS4 look fantastic. Gaming on this TV is like staring into a window of the graphically heavy content at your disposal and that is something worth experiencing. Speaking of sound, the Sony A9F has improved upon the acoustic surface we saw with the A1 and the A8F. 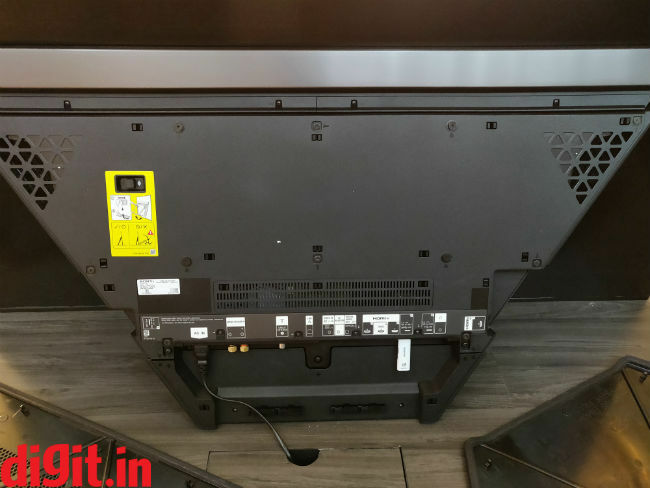 instead of 2 actuators, the TV now comes with 3 actuators and instead of 1 subwoofer at the back, the TV comes with 2 to enhance the sound experience from the TV. We really enjoyed the performance of the audio from the A8F and the same can be said about the A9F. How well the sound has improved is something we can only say when we have the two TVs side by side. But what we can say is that soundtracks of certain movies and games sound pretty good on this TV considering the speakers on this TV are for a TV and not a home theatre. Blade Runner 2049 is a good example of this. The opening minutes of the movie is filled with subtle cyberpunkish music mixed with silence and of course Ryan Gosling’s hover car. Other movies be it Wonder Woman Spider-Man Homecoming, shows on Netflix and even everyday TV viewing sounds pretty good, especially when you compare it to other TV speakers in the flagship range. One feature that is quite impressive and unique to the A9F is the ability to use the TV as the center channel of your home theatre. 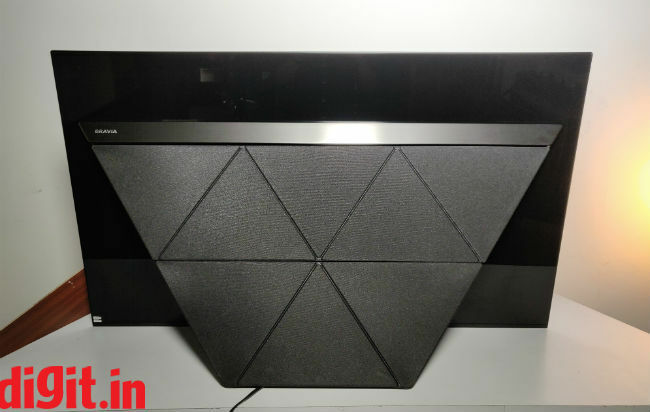 At the back, you will see the option to connect the TV as a center channel with your amplifier. This essentially eliminates the need for you to have a center speaker below the display and since the actuators work to represent the dialogue from the respective position on screen, the setup works quite well. The remote of the A9F is the same as it was on the A8F and there is literally no changes here. As much as I complain about it being too traditional when compared to what LG offers with its Magic remote, the Sony remote is functional and gets the job done. On the remote, you have a shortcut for Netflix and not any other streaming service. 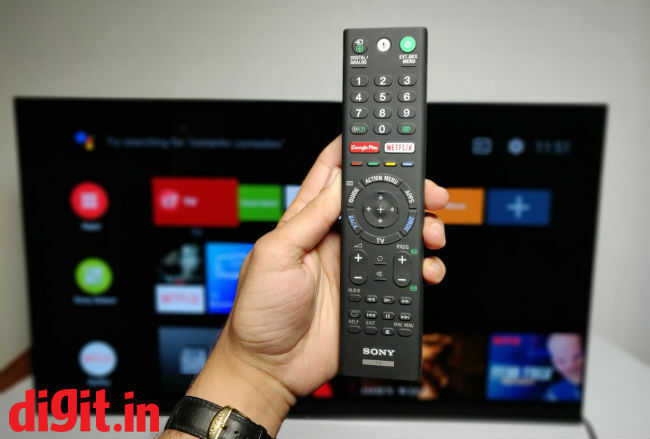 If you see how LG and Samsung have their motion enabled remotes, minimalistic, stylish and convenient to use, then Sony’s remote feels outdated. Welcome Android TV 8, how we’ve missed you! The UI on the A9F is Android 8 and different from the one we have seen on the A8F. To begin with, it is smoother, faster and more responsive. Pressing the action button to get to the picture and sound settings no longer takes a while. The UI is clean with the top panel being customizable with the apps you want. Everything else is laid out in rows from hot picks to trending videos to Netflix recommendations and more. The voice search works quite well. You can say things like “play daredevil on Netflix” and it will open the Netflix app with Daredevil being in front of you. Sadly, you can’t say things like “play season 3 episode one of daredevil on Netflix”. It won’t recognize that. From opening apps to getting content ready, apart from typing in your password, there is little reason for you to use the remote to navigate. It works quite well. The source selection and setting are at the top right of the UI. The Sony A9F is a fantastic TV for those looking for an immersive content consumption experience. 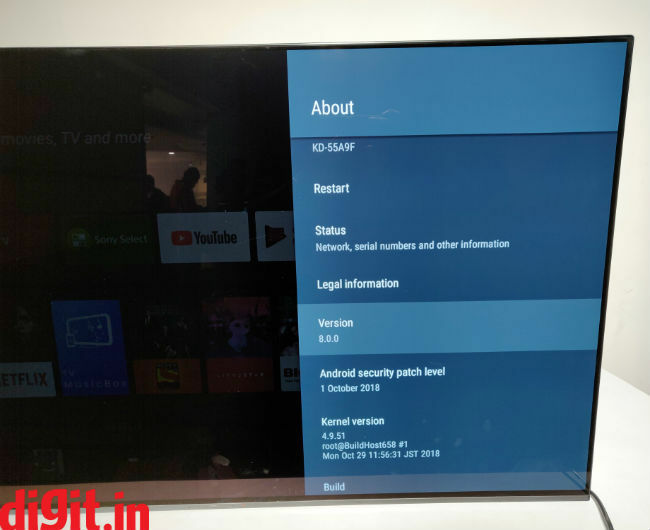 The new processor brings with it advancements in HDR processing, the TV can upscale HD content quite well, comes with ample connectivity options including the option to use the TV speakers as the center channel in your home theatre. The UI is fluid and native streaming apps means you don’t need to resort to an external device. The TV is great for 4K gaming too. The only downside is that some Dolby Vision content looks a little dark and the TV is extremely expensive. But if pure performance is what you are looking for then you can’t go wrong with this TV. If an alternate is what you are looking for at a lower price point, then you can consider the LG C8 OLED TV. The pictiure quality of the C8 is fantastic however it loses out to the A9F with audio quality. You can read our review of the C8 here. It is much cheaper and the OLED performance is almost at par between the two.